Hannay Reels' N400 Series welding reels are designed to improve the efficiency of welding operations. 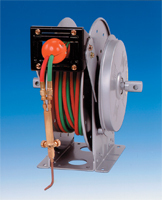 The reel handles ¼" or 3/8" oxygen/gas hose in lengths of up to 100 ft, and features two swivel joint inlets and two outlet risers to handle twin gas welding hose. The narrow frame design is ideal for limited space mounting.